Gold’s gone through the meat grinder these past couple weeks. And as it goes shrieking into the whirling blades, it’s dragged gold miners along with it. 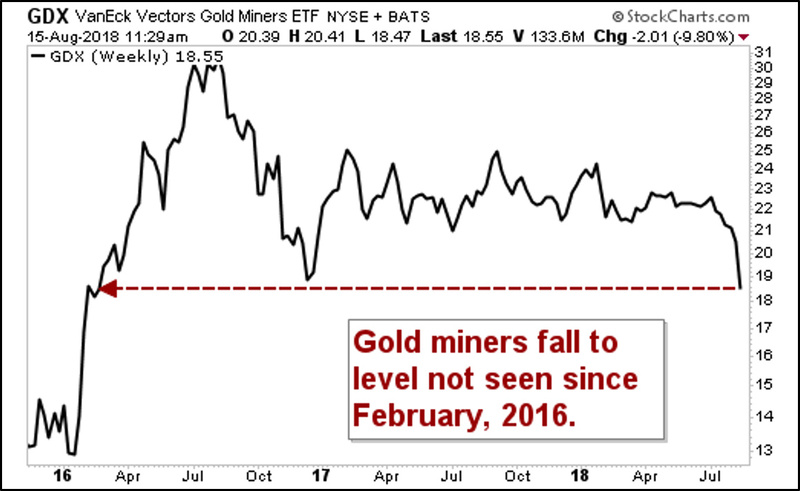 Heck, gold miners have fallen to levels not seen since 2016. Man, that is no fun at all. I’m talking about mean reversion. Let’s look at my next chart. This one is a chart of gold. You’ll see two levels of support on the chart. The blue line is at $1,190. Gold seems like it will slice through that support “like buttah.” And maybe it will. Or, it could snap higher by the end of the week. Because, you know, the market loves misdirection more than anything else. Below that blue line is a green line at $1,145. Gold last saw that level at the start of this year. That’s more support. In other words, another place for a rally to find footing. 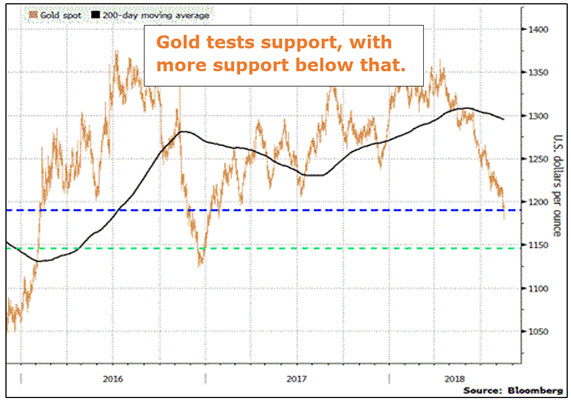 Finally, the black line on the chart is the 200-day moving average for gold. When we talk about “mean reversion,” many people mean the 200-day moving average. It can act like a magnet when stocks or commodities get too high. And it can draw those same stocks and commodities higher when they dip too low. 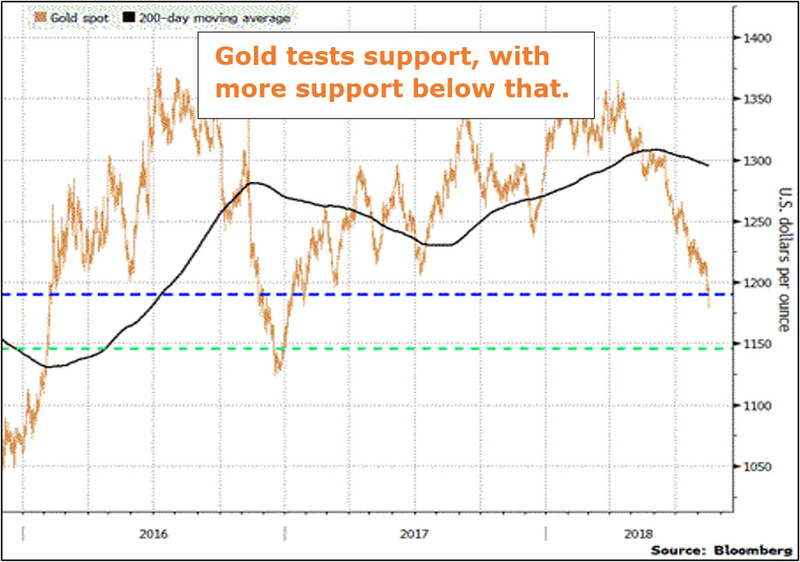 Right now, gold is trading WAY below the 200-day moving average. A reversion to the mean would not be surprising. And I’ve shown you two levels of support where it could happen. Watch the weekly closes. Why is gold’s rout happening? The market has forgotten about mean reversion, which shows a place for a gold rally to find footing. And I think you’ll be surprised at how well golden turkeys can fly higher from it. Gold is plunging because hedge funds are ratcheting up their short positions in bullion and gold-focused Exchange-Traded Funds to record levels. I’m talking RECORD levels. As often happens in the markets, when everyone runs to one side of the boat, we see a sudden, jarring shift to the other side. On Tuesday, I published an article titled “Is Gold Still a Safe Haven? 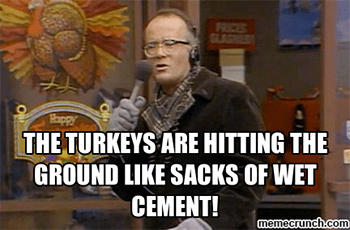 Let’s Talk Turkey.” Well, most traders hate gold and miners right now. Those miners are falling out of the sky like turkeys pushed out of a helicopter. You might want to catch a turkey or two. Because buddy, when the big reversion comes, you’ll be surprised how well turkeys can fly. I tried to watch the briefing on why one shud sell their gold coins and deal in junior mining stocks but it was so long and repetitious that I got frustrated and quit. Also it appears to be a couple of years old. Disappointing considering that I signed up just yesterday for supercycle investing. Hi, PJ. Some people want longer videos, some people want shorter. We try to strike a happy medium. But to be sure, I’m a guy who likes to talk. You may have found an old video by accident. Contact customer service and they’ll point you to a more recent Skype call that Martin and I recorded. I’m not as smart as you folks at figuring out why gold and silver are being held down. My thoughts are different than yours. I think China is the largest holder of gold and silver and would like to have their currency backed by gold. They are devaluating their currency, trying to get it low enough to switch to a gold standard. 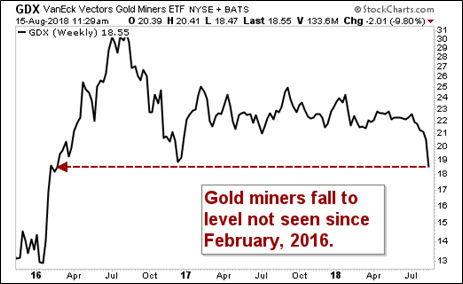 This scares the heck out of the USA and our government is printing billions of worthless money to have Ole’ JP short the ETFs and hold the gold value down. That puts China in a bind and keeps them unable to proceed with their plans. If they were able to succeed, our dollar would be worth toilet paper. yes, but China also wants to be an export power, doesn’t it? Its economy depends on exports. For that reason, it wants a cheaper currency. That could change in the future. One country you should really keep your eye on, though, is Russia. They are buying a bear-load of gold, and selling U.S. Treasuries at the same time. The experts think this is to prepare for the next round of U.S. sanctions. We’ll see. Finally, keep an eye on Germany. They are complaining about U.S. sanctions on Iran and say there needs to be a financial system not controlled by the U.S. (i.e., a non-dollar-based system) for international commerce. I see THAT as a potentially shorter-term threat to the US dollar than the other two.